As cooks and food lovers you understand that the best meals come from using the finest ingredients. Those ingredients come from seeds that have been handed down through generations and preserved by gardeners and seed companies, like Landreth,who keep the supply alive. But what does this mean for people like readers of Under The Tuscan Gun and viewers of the cooking show, Extra Virgin, with Debi Mazar and Gabriele Corcos? This isn’t an issue that only affects gardeners because this goes beyond just pretty flowers and extends into vegetables that are listed on Slow Food’s Ark of Taste. Foods that are in danger of extinction. Yes, fruits and vegetables can go extinct if nobody is selling their seed, nobody is growing them. It affects the preservation of the culinary history of African-Americans. It takes down another woman-owned business. It kills part of America’s history. We lose one more seed company acting a barrier between us and monocultures and GMOs. And one day you’ll see the effects on your dinner plate. 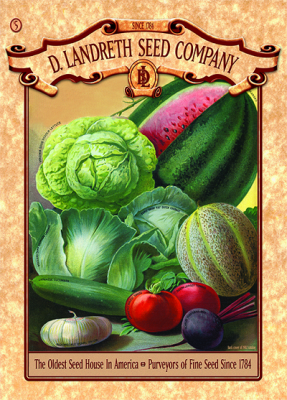 You can join the campaign to save America’s oldest seed company by visiting the Landreth Seeds website and ordering a catalog for $5.00.